Have you been to PaperCraft Planet lately? They've been running a 12 days of Christmas contest - this is the card I created for Day 5 - the theme is Circles/Rings or anything Round. My bride and groom with sentiments come from SU's To Have and to Hold set. I stamped them in versarmark on shimmer paper and silver embossed. The sentiment on my base card is from this same set, but stamped in black. The circle edging is created with the Scallop Edge punch, then I added a little piercing to dress it up a bit. The sentiments on my circles were created with the JustRite Wedding Stamp Ensemble and Harmony Classic Circle I 1-5/8” . 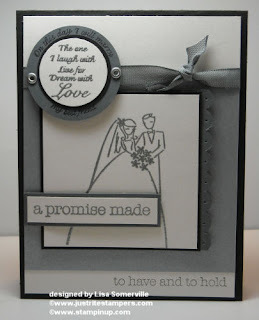 I stamped my sentiment in versamark, then silver embossed on shimmer card stock. Punched my image with my 1-1/4" Circle Punch, then layered onto a black 1-3/8" Circle, then onto my 1-3/4" Gray Circle that I had already stamped with another sentiment from the Wedding Stamp Ensemble set. I added silver eyelets, then attached to my card over my Gray Taffeta ribbon with dimensionals. Very beautiful card. It's so elegant!